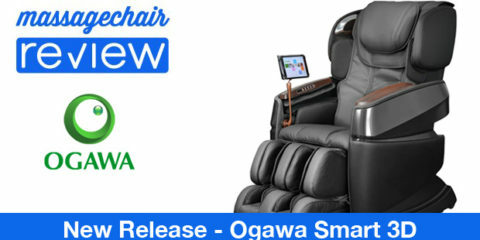 Ogawa Smart 3D Review - Is it the Best Massage Chair? 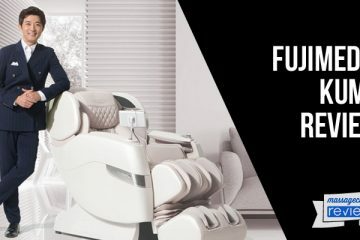 Fujimedic Kumo Review – Can a Japanese made 4D L-track massage chair really be the best? Infinity Celebrity Review – Is This 3D Massage Chair Really a Star? Infinity Genesis Review – Will This Zero G Massage Chair Change Your World? FAQ – What exactly is 3D Massage Roller Technology in Massage Chairs? Whats More Important? The Bodies Appearance or Function? Osaki FAQ: How Many Airbags Does the Osaki OS-4000 Have? Before we do the Osaki OS 4000 Review, I think it’s important to know that people are not new to the overall benefits, relief, and general well-being that a wonderful massage can provide. It’s also important to know that Massage Chairs like the Osaki OS-4000 are becoming common place in many different settings, like the home, office, doctor’s office, chiropractors office, spas, and even executive offices. The one thing we are new too is the Massage Technology industry with its bustling variety of professionals and businesses who are working hard to build great Massage Chairs and Peripheral products to make life better. Simply put, Massage Chairs are as varied as the methods provided for offering relaxation, relief, and refreshing techniques. Let’s get on with the Osaki OS-4000 Review and see where it stands in its own brand and against competitors. 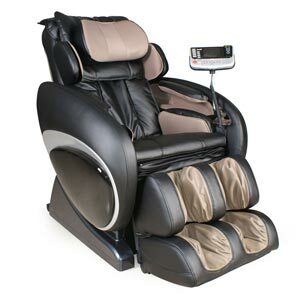 First of all the Osaki OS-4000 is one of the unsung heroes in the vast array of Massage Chair Products. But why? For instance, The OS-4000 is the marquee chair produced by Osaki and can go head to head with many of the other top and more well-known brands like Sanyo and Panasonic. At first look many notice the style. Osaki has done extensive research in making this chair modern, sophisticated, and simplistic enough to adapt to any setting it resides in. It also comes in several stylish colors like Black, Charcoal, Crème, and Brown. Some have even mentioned that it looks like a pudgy leather robot, and others think it looks like a futuristic therapy throne. 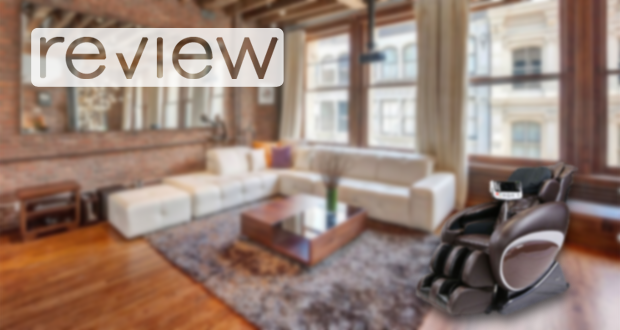 In any case, it definitely catches the eye and at first glance, it can be recognized for its quality. The Osaki OS-4000 feels right at home in the most laid back, technologically advanced, or luxurious of settings. 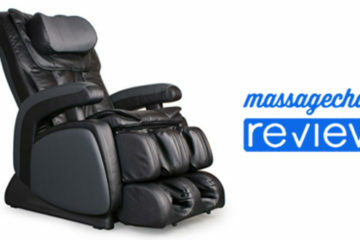 Another feature that has made huge waves in the Massage Technology space is Zero Gravity. If you’re not familiar with Zero Gravity, it’s a technology that was developed by NASA and has been adopted across many applications. Essentially it is considered the natural body posture most suitable for massage displacing pressure across the human body instead of one specific area. Osaki has adopted this technology and has been pushing forward with it much like Sanyo has done with their higher end chairs. Osaki has also been looking forward in the type of Massage Technology it builds its product around so let’s take a minute to explore the intricacies. The OS-4000 boasts 48 airbags that can target all major parts of the body. Airbag massage is sometimes overlooked but its one of the major advantages to actually achieving an effective deep tissue massage. These airbags can cover the Shoulders, Neck, Hip, Arm, Lower Back, Calves, and even Feet. They also have one of the more advanced rollers and kneading mechanisms available. This technology mimics a human hand in the way that it can grasp, knead, and focus on a specific problem area. 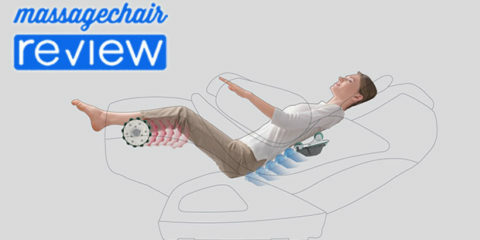 They have also developed a 30inch roller that is able to deliver a massage to someone who is Six foot four to someone who is Five foot four. One other piece of advanced technology is their Body Scan. This technology is able to recognize specific vitals of an individual to give them a more customized massage. Say for instance you suffer from lower back pain, or you need a special focus on relaxation to help ease hypertension. The OS-4000 is able to pick up these subtle nuances so that you are able to maximize your massage therapy. The OS-4000 can all be controlled by a wireless remote. This also makes it easy to give your friends or spouse a customizable and unique massage experience (of course after you’ve gotten your fill.) I’ve even heard of people plopping down in the chair when visiting their chiropractor and having everything controlled by a staff member from across the room. Another positive attribute of Osaki, in general, is their Warranty program. They offer a 3 Year Warranty that covers the product no matter what type of setting the Chair is used in. Many other Brands null the Warranty if the Chair is used in a commercial setting. This means a lot when a brand is willing to stand by its product in both an everyday and commercial setting where the use is extremely different. Osaki recently introduced mechanical foot rollers to the OS-4000. This definitely adds to the massage experience and gives a great massage that targets the acupoints in your feet. This is a great addition for people who are on their feet often. With all these things considered, the Osaki OS-4000 Review definitely stands above the rest in it’s specific price range. Massage Chairs are no doubt a big purchase, but many are realizing the ease of use and the amount they get back over time. 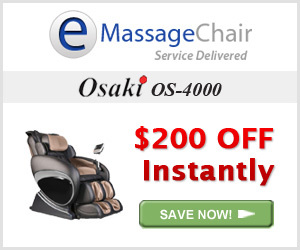 A wise investment for those who need it, and if you want quality along with a good price the Osaki OS-4000 Massage Chair is a serious contender. 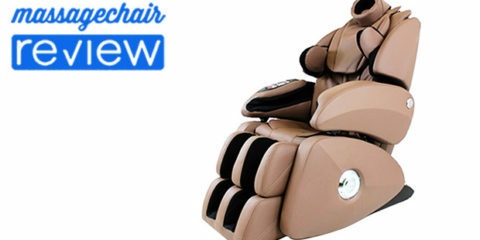 Make sure to check out Emassagechair.com for the best deals and the best customer service for your purchase. 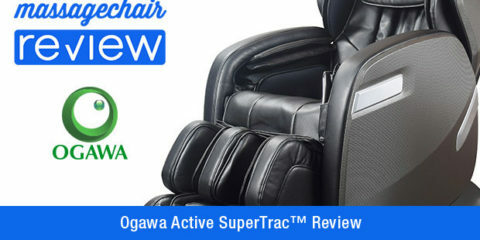 I think there are many dishonest reviews for the Osaki OS-4000 massage chair, it is ok for the price and function of the chair ,but beware of your calves/legs might not tolerate the painfull squeeze and pressure from those airbags and rollers of the calf/leg section of the chair, somebody might appear slight bruise at the calves. I agree, there are a lot of dishonest reviews on the OS-4000, but this is one of the best reviews I have read. I have had my OS-4000 for over a year now, and I don’t have any complaints. And at first the airbags on the calves can be a little too much, but I started using the intensity control on the remote to adjust it. Once you turn that down a couple notches, the massage is amazing. I highly recommend the OS-4000 over the majority of massage chairs on the market. It is one of the best models for the price. I am also commenting to make you aware of of the nice encounter my daughter had when she was browsing your web page. She came to find many things, which include what it’s like to have an ideal teaching spirit, and helping her because of her difficulty completely grasping some extremely tough subject matter. Thank you for imparting such insightful, dependable, educational not to mention unique tips about your topic Steph and Julie. You actually exceeded visitors’ expectations. Hi there. You’ve performed an excellent job. I’ll definitely digg it and personally suggest to my friends. I am confident they’ll be interested in this web site. Hi, I came to youre website, and I have read some awesome posts on it. This is the best weblog i have ever read. Thanks for publicing this usefull information. I do agree with all the ideas you’ve presented in your post. They are very convincing and will certainly work. Still, the posts are very short for beginners. Could you please extend them a bit from next time? Thanks for the post. Thank you so much for your hard work and designing this website. I found the information here great. Precisely what I was looking for, appreciate it for posting . I am really inspired along with your writing skills as neatly as with the format in your blog. Keep up the excellent quality writing, it’s rare to see a great blog like this one nowadays..
My brother suggested I might like this blog. He was entirely right. This publish actually made my day. You can not imagine just how much time I had spent for this info! Thanks! Keep posting stuff like this, I really like it! Good job friend! Thanks for another fantastic article. Where else could anyone get that type of info in such an ideal way of writing? I’ve a presentation next week, and I am on the look for such info. This is the first time I saw your web page and thus far, I’m amazed with the research you did to make this particular article incredible. Fantastic job! I really prize your work. Great post and nice site. I will tell my friends. Cool post, really love your blog. So a lot info on 1 page, kudos to you, it ought to have taken you a long time to write this! Wonderful beat! I wish to apprentice your site! I was very pleased to find this website.I wanted to thanks for your time for this wonderful read!! I definitely enjoying every little bit of it and I have you bookmarked to check out new stuff you blog post. There’s some validity, on the other hand, I will hold my opinion until I look into it further. Good article , thanks and that we want more! Added to FeedBurner at the same time. First rate article. I just came across your blog and want to say that I have really loved reading your blog. Well I’ll be coming again and I hope you publish again soon. I would like to point out my passion for your kind-heartedness supporting those people that need help with that niche. Your real commitment to getting the solution around has been particularly useful and have regularly enabled those just like me to get to their endeavors. I was extremely pleased to find this web-site.I want to say thanks for your time for this amazing study!! I ACTUALLY absolutely love every single little piece and I have you bookmarked so I can check out latest items on your blog post. This actually answered my question, thanks! I enjoy you because of all of the effort on this web page. Enjoy the rest of the year. You’re doing a pretty cool job. I definitely enjoy your website and uncover the vast majority of your post’s to become just what I’m wanting for. This is a right blog for anyone who desires to discover this topic. Thanks! Appreciating the hard work you put into your blog and detailed information you present. It’s awesome to come across a blog every once in a while that isn’t the same outdated rehashed information. Wonderful read! I’ve saved your site and I’m adding your RSS feeds to my Google account. Great work! This is the kind of info that are meant to be shared across the internet. Disgrace on Google for making this so hard to find. great submit, very informative. I wonder why the other specialists of this sector don’t notice this. You should proceed your writing. I’m sure, you’ve a great readers’ base already! I like material like this. This is a fantastic post and I really enjoyed reading it. You’ve got an original style that makes your suggestions stand out from other writers. 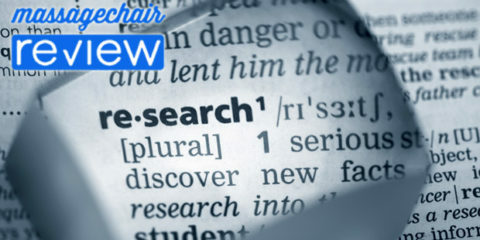 Hello there, I am Carrol Charbonneau and I have to mention that ” Official Review of the Osaki Os-4000 Massage Chair | Massage Chair Reviews & Resources ” is definitely a great publish. Simply want to say your article is as amazing. The clarity in your post is simply spectacular and I can assume you are an expert on this subject. This could be a perfect example of one of the most helpful sites on this matter. Actually Spectacular. I am also a professional on this topic so I understand where you’re coming from. Yeah bookmaking this wasn’t a hard decision, outstanding post! Greetings! Very useful advice in this particular article! It is the little changes that produce the most significant changes. Thanks a lot for sharing! Entertaining blog post – cheers. Extremely absorbing and well written article. I will come back very soon. This web page is great for all of the information you wished about this and didn’t know who to ask. Glimpse here, and also you’ll undoubtedly discover it. Its such as you learn my mind! You appear to know so much about this, such as you wrote the ebook in it or something. I feel this is great blog and a great read. I’ll definitely be back. Woah! I’m truly loving the template/theme of this blog. It is simple, however effective. Lots of times it’s difficult to get that perfect balance between user friendliness and visual appeal. I need to say you’ve got done a amazing job with this. Also, the blog loads super quick for me on Opera. Superb Weblog! As I site owner I feel the subject material here is real great, appreciate it for your efforts. Appreciated every bit of your post. Please keep writing. I am very happy to read this. This is the type of info that needs to be given and not the random misinformation that’s at the other blogs. Appreciate you sharing this. I am trying to find a seller in southern California to try the chair before buy it and I can not find any store. I can not even find the information of the manufacturer on line to ask who is the their distributer. Thank you for contacting us. I know there are a few locations in southern California that carry massage chairs. You can check out Relax The Back, they have a store locator on their website. They have a few models to choose from and I believe have a comparable model to the OS-4000. I would also suggest going to Emassagechair.com and contacting their customer service, I know they have a retail network that they work with that and may have someone in your area that carries the OS-4000. I hope that helps.